Even though May, and therefore Melanoma Awareness Month, is about halfway over, there’s still plenty of time left to bring you even more informative posts pertaining specifically to the damaging effects of the sun, skin damage, skin cancer and Melanoma. Today we’d like to talk about just how easy-and important-regular Full Body Skin Exams of your skin is. There is an ongoing effort here to practice what we preach. So at a recent visit to my general practitioner’s office, I asked my doctor to check the places I can’t see, (such as my back and ears) for any signs of skin cancer. I didn’t have any particular concern about the disease, but neither do many people who end up finding out they have it. 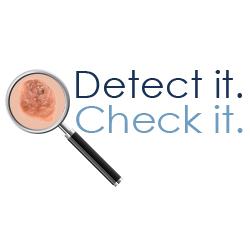 With Melanoma the speed of its detection means everything, so a check is always prudent. For the purposes of writing this blog piece, I also wanted to gauge (for our readers) how long and how simple (or difficult) the process was. The process is completely non-invasive. And you’ll find out right then and there if there are any issues of concern in need of escalated attention. It’s far simpler than most of the other exams we’ve all experienced, too. In fact you may recall the unsettling feeling associated with giving up the occasional vial of blood, and then having to wait around a week for results. Then as that week goes on, with increasing (often needless) worry, you’ll start wondering if a lab tech somewhere will find some condition you hadn’t even thought to think of before. The good news is that a skin check is nothing at all like that. Skin cancer is the most common cancer in the world, and it can begin on any area of your body. Even on the areas that rarely, if ever, see the sun. And while it is true that Melanoma is more prevalent in fair-skinned Caucasians, it can, has, and will continue to affect every race, all ages and both genders. It’s up to us each individually to do what we can to swing the odds in our favor. The fact is that in the majority of cases skin cancer is first spotted not by doctors, but rather by their patients themselves. That’s why routine self-examinations are vital. And why it’s just as important to have the areas of your body checked out that your eyes can’t reach. Melanoma, if caught early enough, can be cured. If not it can spread beyond the skin and into the internal organs, where it then becomes a disease no one would ever want any part of having to deal with. So please, do yourself a favor and have your doctor take a quick look at you. You could be doing yourself the biggest favor of your life. « Why is it Important to Protect Your Skin from the Sun?